When I tasted a skinny slice of Rachel’s lemon meringue pie from the Ballymaloe Cookery School’s demo board last month, I knew I’d found the perfect dessert for Easter dinner. We have such an early Easter this year that there are no local blossoms and scarcely bits of fresh green outside. Pencil daffodils wait in the supermarkets along with boxed California berries, huge, hard, and sour. But we do still have lovely citrus with abundant lemons. Actually what could be better than a puckery tart lemon pie with a billow of marshmallow meringue in the wake of a rosemary-studded roast leg of lamb? Here’s the lemon pie of your dreams. Too often our American lemon pies with cornstarch-thickened fillings are too sweet, and the meringue goes all sticky or weepy with the slightest wait for dessert. In this Irish version we have a flaky short crust pastry shallow filled with tart thick lemon curd—no cornstarch, minimal sugar. A cloud of thick meringue caps the pie and slowly bakes to crisp ivory dome with a soft interior. One bite of this pie gives you the balance of sweet and tart that is just right, as you wonder why so many lemon meringue pies have missed this beat. An important part of the preparation is to have both the baked pastry shell and the lemon filling cool before the meringue goes on. The long, slow final baking allows the meringue to crust and to cook through so it holds well. If there’s a slight sugar weep after the first slice, just spoon the bit of syrup out of the pie dish to keep the crust crisp. This is an easy dessert to manage on a busy day. The filling can be made two days in advance, the shell baked the day before. Only the quickly whipped meringue goes on the day of your dinner. 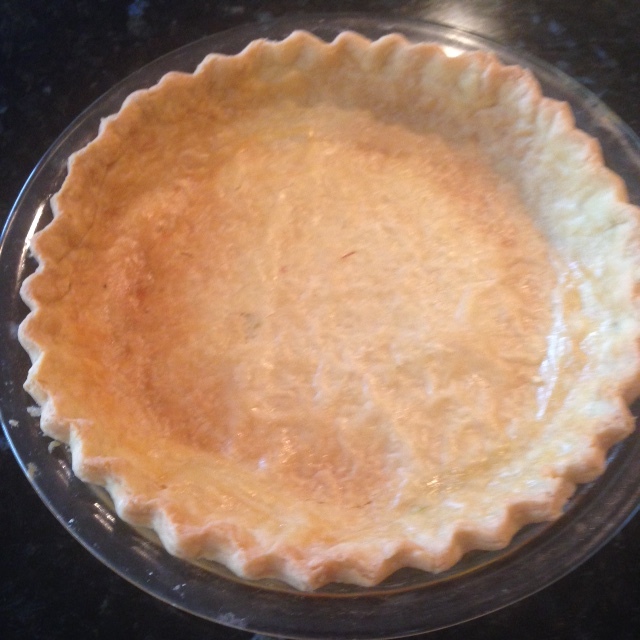 The pie needs to cool at least an hour before serving and can easily wait 2-4 hours at room temperature. Happy Easter, Happy Spring. Place flour and salt in food processor bowl; slice over butter and blitz to a coarse meal. (Or rub butter into flour with fingertips.) Dump contents of processor onto clean counter top. Make well in the center of the mound; add yolk plus 1 tablespoon water. Mix yolk and water with fork and pull in the flour mixture gradually to make firm dough. Add extra spoon of water if needed. Shape dough into a 3-inch patty; wrap in plastic and chill overnight or an hour. Remove dough from fridge, unwrap and tap with rolling pin to soften. Roll gently to a 12-inch circle; fold in quarters and fit snugly into an 8½-9-inch pie plate. Trim ragged edge and crimp border. Chill shell overnight or at least half an hour. Preheat oven to 350°. Line chilled shell with sheet of foil, pressing foil gently onto pastry. Half fill foil with baking beans or pie weights and bake blind for 25 minutes. (Google “baking blind” if this is confusing.) When pastry loses the raw look, remove beans with foil. Brush interior of shell with 1 teaspoon whisked egg white and return pastry shell to oven for 5 minutes. Bake until lightly golden. Cool to room temperature. May prepare pastry shell a day ahead. Rub lemon zest into sugar. Melt butter in small heavy saucepan (enameled cast iron recommended); add half sugar and lemon juice. Whisk egg and yolks in bowl adding remaining sugar. Pour half hot lemon juice/butter mixture over the eggs whisking well and pour contents of bowl back into saucepan with hot lemon butter. Stir constantly with wooden spoon over low heat cooking the lemon curd until thick (5-6 minutes). Lemon curd must not boil as it cooks. It will thicken suddenly. Continue to cook a bit longer until it mounds softly in a spoon or reveals the bottom of the pan when wooden spoon is drawn down the middle. Scrape curd into a small bowl or a glass jar, cover with plastic wrap to prevent a skin forming over surface (tip up one edge of the wrap to allow steam to escape). Cool to room temp. and refrigerate. Egg whites whip best at room temperature. If whites are cool, pour into mixing bowl, immerse bowl in a larger bowl of hand hot water. Stir whites until tepid. Place mixing bowl in stand mixer with whisk attachment. Beat whites until frothy and add sugar quickly, 1 tablespoon at a time. While meringue whips, spread chilled lemon curd evenly in baked pastry shell. 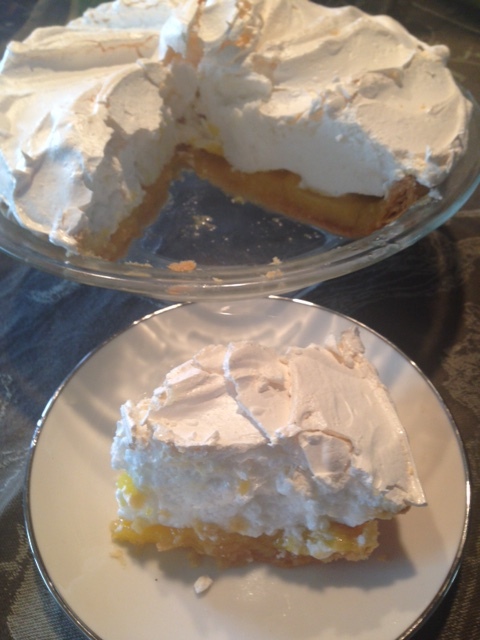 Dollop stiff meringue over lemon curd and use back of a spoon to seal meringue to edges of pie shell. Use spoon to sweep meringue into a decorative topping peaking in the center. Bake meringue topped pie in the center of a 250° oven for 1 hour to 1 hour and 10 minutes. Cool at least an hour before serving. For ease of slicing, gently cut through the meringue first with a serrated knife before using a thin sharp knife. Enough for 8. You are currently browsing the Mary Jo's Kitchen blog archives for March, 2016.